Learn Somali language by taking private lessons from Nazmah Hassan. Nazmah is available for small group and one-on-one instruction for learners of all levels. Learn a new language with friends! Small group instruction is a fun and effective way to improve your language skills in a supportive environment. All small group lessons are a single hourly rate for groups of two to four learners. Advance your language goals by scheduling individual instruction with Nazmah. Great for ambitious learners or those studying Somali for professional or academic pursuits, or who need some extra help ahead of exams. Nazmah Hassan is a available for private Somali instruction on weekends in the Seattle area. Nazmah is a heritage Somali speaker and fluent in conversational Somali. 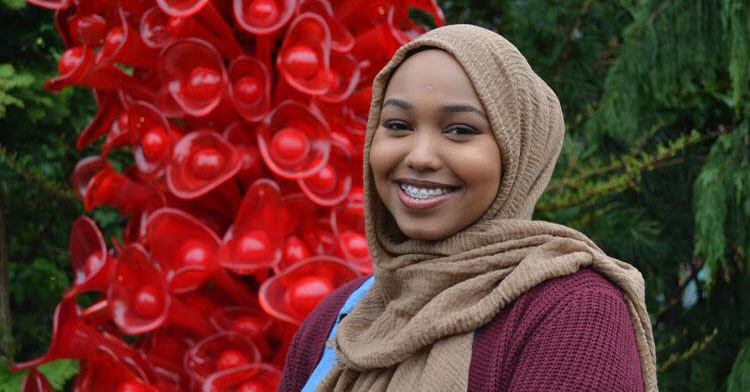 She has worked as a Somali interpreter and translator, and has held various leadership positions at the University of Washington’s Somali Student Association. In addition to Somali conversation, she is happy to provide lessons about Somali history and culture, and to help with learners and intermediate reading and writing. The private lessons detailed above are not taught or managed by One City Project. We are hosting this webpage as a service provider for the instructor and a collaborator in community building, administration, and outreach.